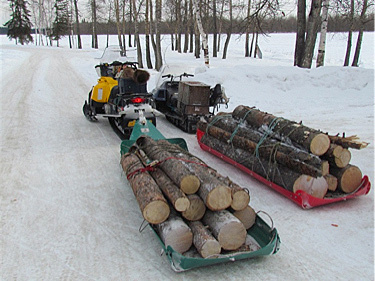 In Alaska there are several ways to transport firewood: trucks, snowmachines, ATVs, boats, dogsled or pull-sled. Location and the time of year will determine the best method or combination of methods to suit your situation. Where roads are numerous and passable, trucks offer two ways to haul firewood-tree length (8 feet or longer) or stove length. 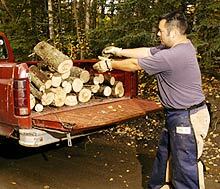 Using a trailer or pickup bed, firewood can be hauled log length, which speeds transportation and allows cutting stove-length firewood at home. Cutting trees to stove length in the woods and hauling them using a pickup truck or a trailer with sides allows the wood to be stacked and cover right away which is the most important process in obtaining seasoned wood useful the following fall. Cut your wood to assure the right size by using a stick to measure. Your method will depend on available equipment, people power and access to the firewood. If you're hauling alone, you should cut close to the road or into stove lengths. If you have a helper, you could carry tree-length wood to your truck or trailer or use a pull-sled in late winter on a packed trail to slide your firewood to a truck, trailer or woodshed. Snowmachines pulling a sled, and ATVs with a trailer work well pulling wood to a truck or your woodshed. They both can pull a sled or ATV trailer full of firewood for long or short distances and can utilize winches to yard logs from the woods. Arctic Cat recently came out with a cargo sled, 74" long by 38" wide by 17" deep that will haul nearly 1/3 of a cord. (A stacked cord of firewood is 90 cubic feet so multiply length by width by height for cubic feet and divide by 90 to determine cords). Freight sleds commonly run 18" to 36" wide by 6.5' to 9' long and 18" high. Trail conditions will determine the load you can haul. Make a snow packed firewood trail the day before hauling loads and the next morning the trail will be firm and frozen ready to haul several large loads. By afternoon cut more wood and groom your trail. Repeat. Important note: snow-machines need extra care because of unpredictable weather and frequent mechanical failures. Always let someone know where you are going and when to start looking for you. Boats and barges also often haul logs and firewood. Logs cut 8 feet or longer are easier to stack and handle on barges and in boats. In past years, log rafts were strung together and moved downstream after breakup or across open water in lakes and salt water. Log rafts can cause environmental damage to fish and aquatic habitat, may degrade water quality, erode banks, and in many cases is illegal. Individual logs can be tied to boats and moved up or down stream or across open water. When logs are towed by skiffs the tow point should be in front of the rudder (or outboard) to facilitate steering and above the top of the outboard but not so high as to cause the skiff to become top heavy and capsize. Ask the advice of someone who has done this. ATVs, most often with an ATV trailer pick up the slack in spring, summer and fall and are versatile–more wood-carrying capacity on limited roads. They can transport material to your truck or from your boat to your home and also replace large logging equipment in remote areas. ATVs also excel at yarding logs (moving logs to a central pile) from the forest and then transporting them to your home. These vehicles come in both sport and utility models. Sport models are small and light with two-wheel drive, while utility models feature larger four-wheel drives to haul or carry loads. For instance, you can haul a log directly behind an ATV with a winch kit, load wood onto a cargo rack, use a cargo sled or lift a log off the ground with a special arch or use an ATV utility trailer. A number of companies make logging equipment for ATVs, but consider the lay of the land and your needs before buying. One company, Future Forestry Products, Inc., makes an ATV forwarding arch that can lift up to 2,000 lbs. for low impact logging. And BAP Equipment features a line of ATV logging equipment. So, with rising oil prices, you could make firewood harvesting and sales a viable business. Check out the resources of ATV logging below.